Rumours were circulating that government has increased the regulatory customs tax on all imported cars, used or new. PakWheels.com felt that it is our duty to reveal the true picture. Tell us what you think about this in the comment section below. 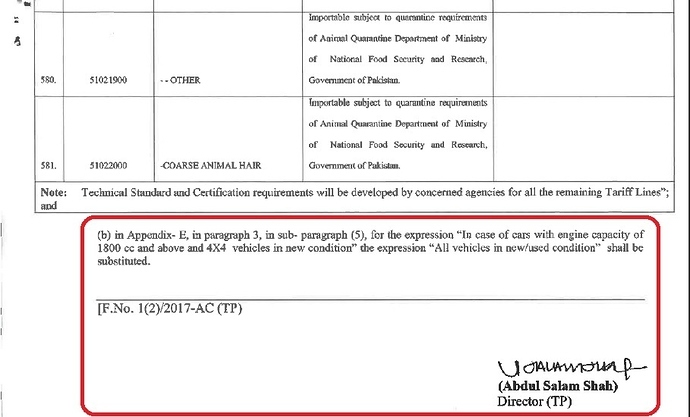 another SRO 1067 /2017 dated 20 10 2017 is issued. Besides edibles. 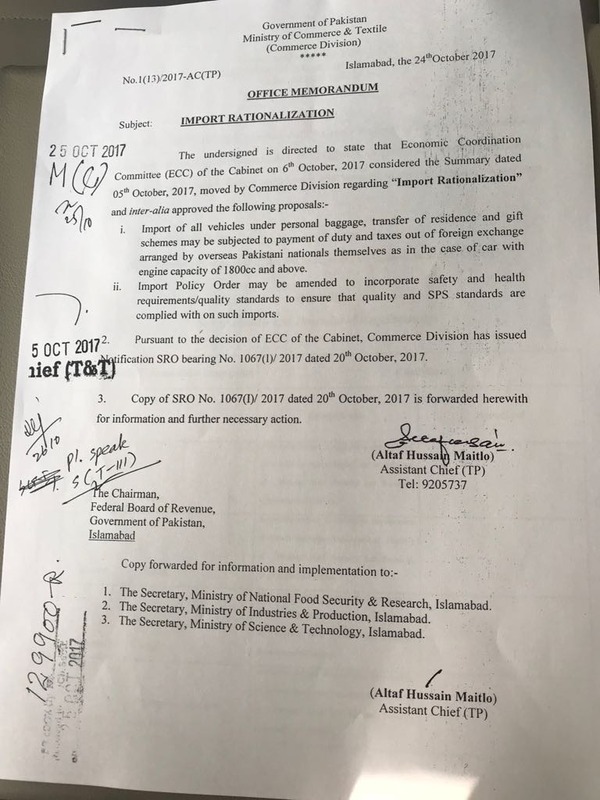 Vehicles landing after 23.10.2017, under baggage / gift scheme the importer has to pay the applicable taxes in foreign exchange with passport number mentioned on transaction. 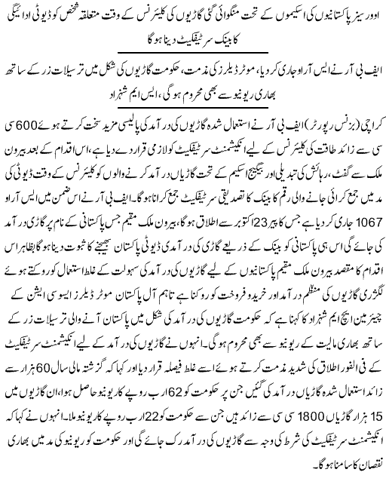 Payment in PKRs will also be accepted against proof of foreign remittance landing / encashed at the scheduled bank. @capsat is this what you are talking about? However, I didn't find the said SRO on FBR website. Please post the link here if you come across it. 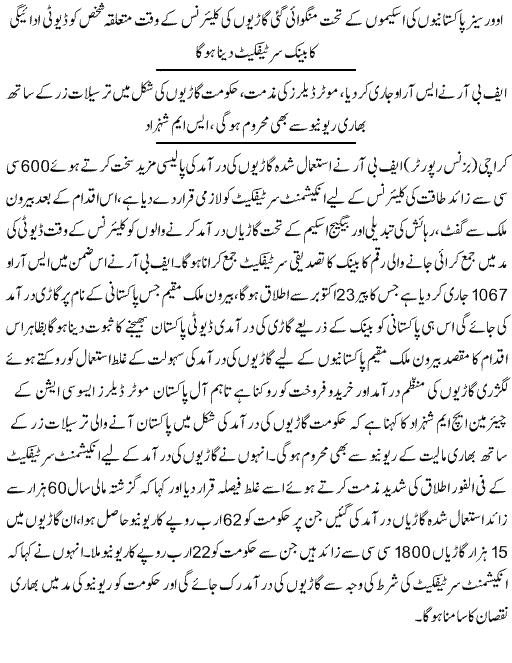 This news is published in today's Express newspaper. This is Import Policy which is presently prevalent. I am asking about the changes which will take effect regarding changes in SRO 1067 as mentioned in news attached in my above post. I could not find any SRO 1067 / 2017 Dated: 20.10.2017 on FBR website as you stated in your above post. further i can simplify it - the above SRO is AMENDMENT TO Import Policy 2015-2018 .. So locate the import policy locate Appendix- E locate para 3, sub para 5 and replace the wordings. 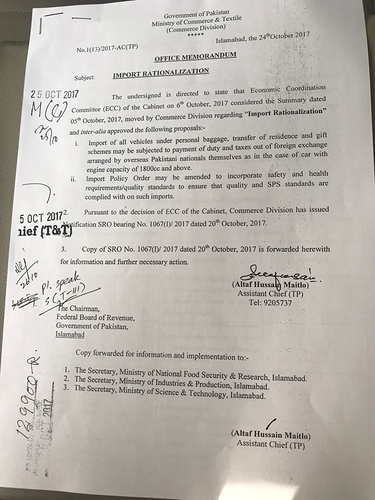 how tough it is for common man like EX-PM Shareef to know " Mujhay Keyon Nikala "
Thanks for your help bro..
"In case of cars with engine capacity of 1800 cc and above and 4x4 vehicle in new condition to be imported either under personal baggage or under gift scheme, the duty and taxes will be paid out of foreign exchange arranged by Pakistan Nationals themselves or local recipient supported by bank encashment certificate showing conversion of foreign remittance to local currency." So does this mean, earlier this rule was only applicable to cars with engine capacity of 1800 cc and above but now this is applied to used cars as well beyond engine capacity of 600 cc.? Can you elaborate, what will be the implication of this rule for cars currently in transit or being transported in coming month? Here is a Memorandum issued on 24.10.2017 regarding SRO 1067(1)/2017. With this it looks, the amendment is not applicable on vehicles below 1800 cc. Let's hope for the best.